*You can find the previous tutorials in this series on my Tutorials page. 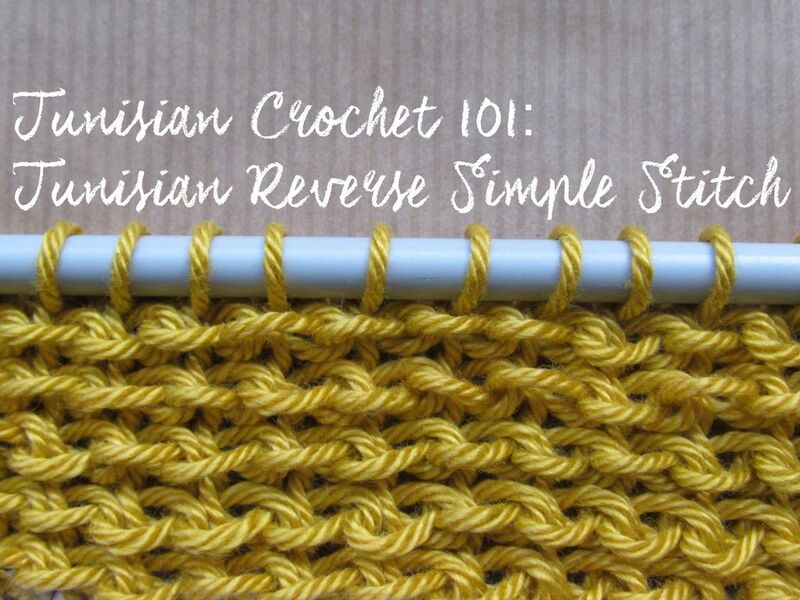 I am back with another tunisian crochet tutorial, this time we will learn how to work the tunisian reverse simple stitch. 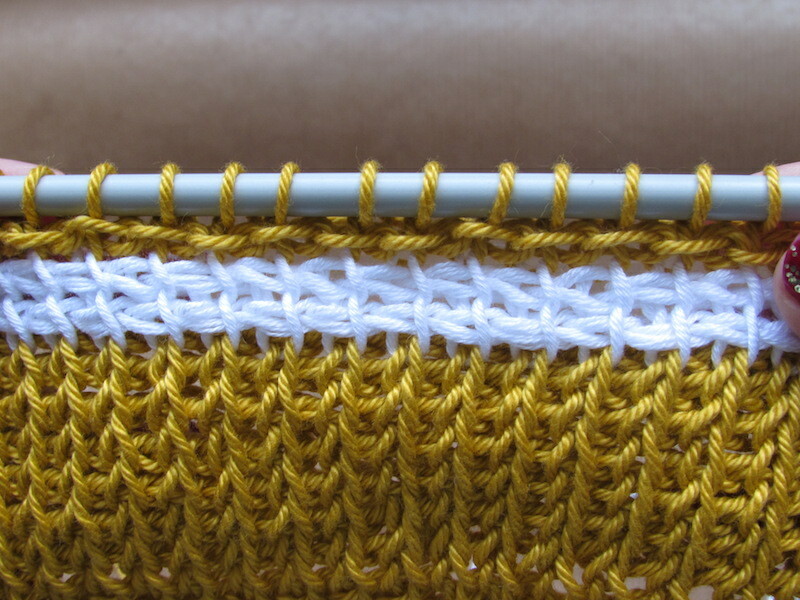 The look of this stitch is very similar to a purl stitch in knitting and also to the tunisian purl stitch which I will teach you on a future tutorial. It creates a lot of texture in the fabric and it sits “higher” than other stitches which creates a nice effect such as in my latest chunky cowl where I used it to create colour stripes against a tunisian knit stitch background. So, we will add this stitch to our tunisian sampler, which I have to say I am hating at the moment because cotton was probably not the best choice to demonstrate some stitches that look a lot better in something like wool and also because that yellow is not the nicest colour in the world… I almost started a new sample but I though I should keep the same one to avoid confusions but I do apologise if its not looking great, I am sure yours is looking a lot better! This is how my (sad) sampler is looking at the moment, we left off with a colour change back to yellow and we have an undefined row ready to be worked. 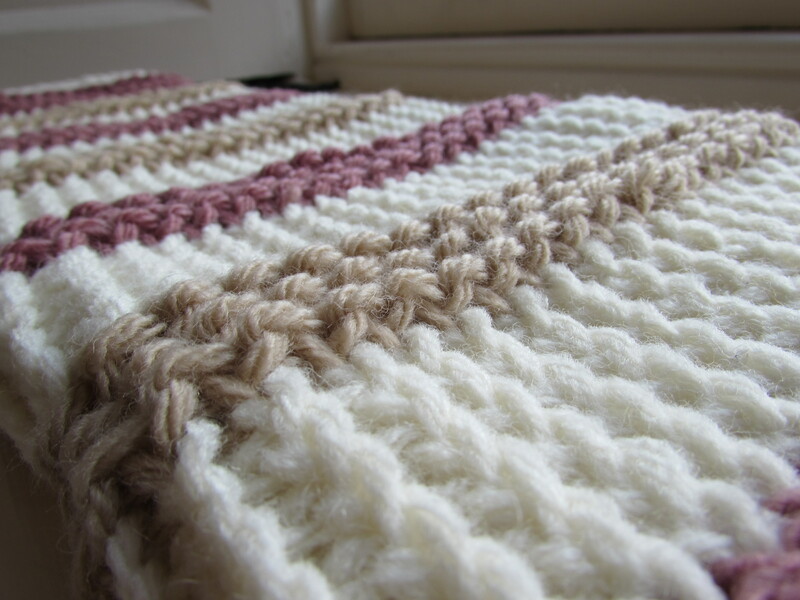 To work this stitch we need to go back to understanding the anatomy of the undefined row. Remember we have front and back vertical bars and a horizontal chain going through them, as the picture shows. 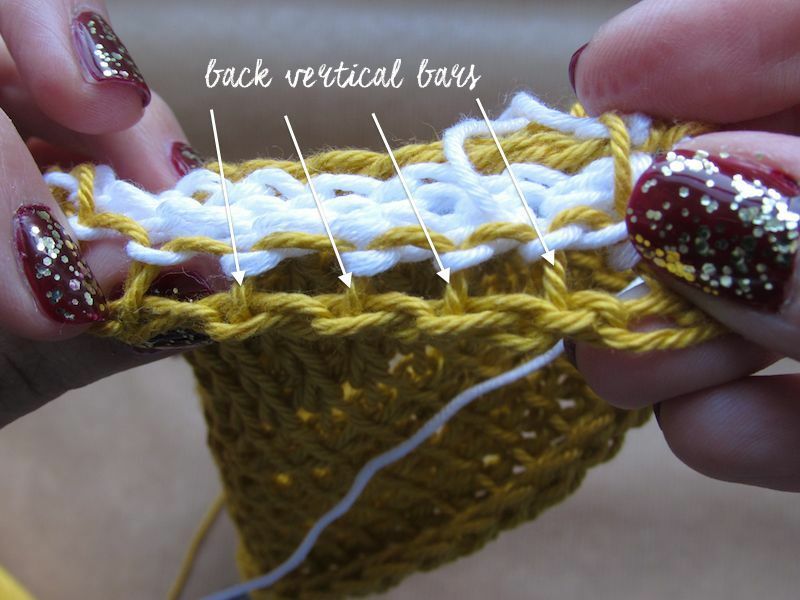 For the tunisian reverse simple stitch (Trss) we need to work on those back vertical bars, which you can see better if you turn the wrong side of your work towards you. 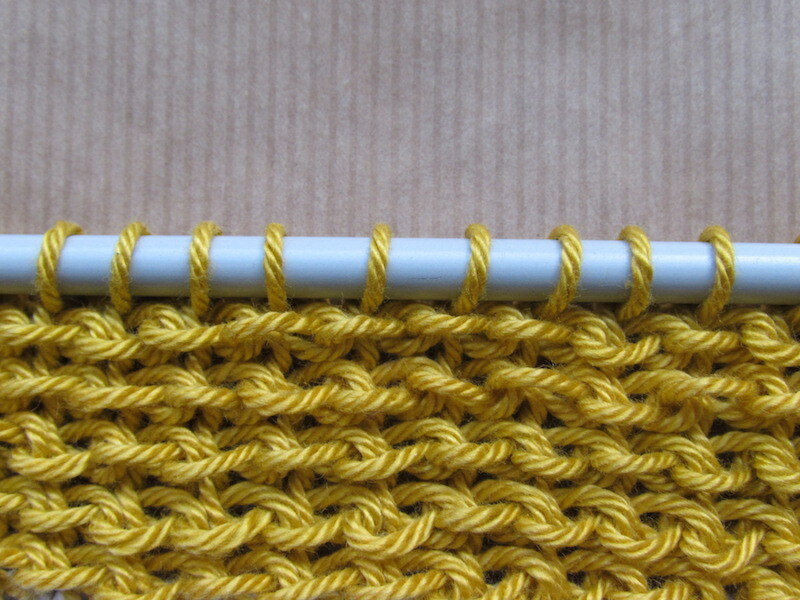 Identify the back vertical bar for the second stitch. 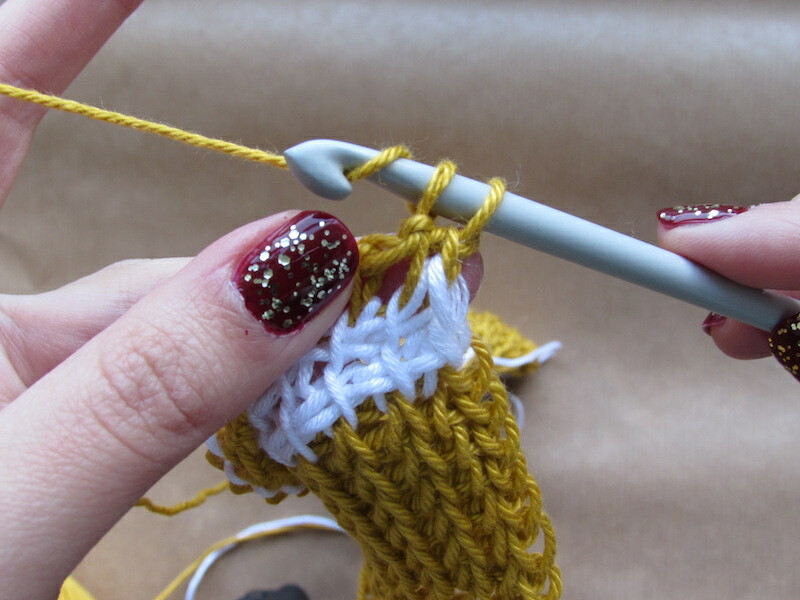 With your hook on the back of the fabric and your yarn behind your hook: insert under back vertical bar from right to left. Yarn over and pull through. This brings that back of the work towards the front, giving it that “purl look”. 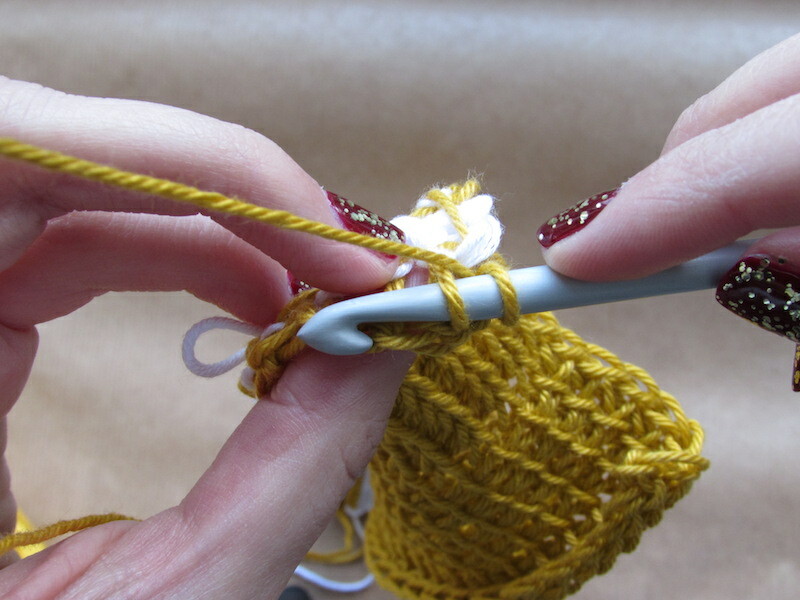 Keep on going with the rest of the stitches the same way, making sure your yarn is on the back of your hook and not at the front. 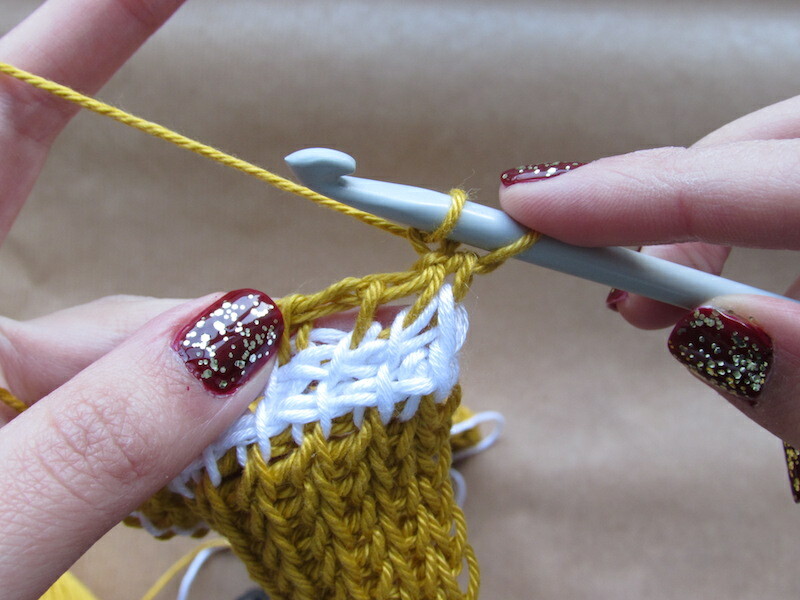 Work the last stitch normally (check this tutorial if you don’t know how to work the last stitch). Once you finish the forward pass you will get something like this. 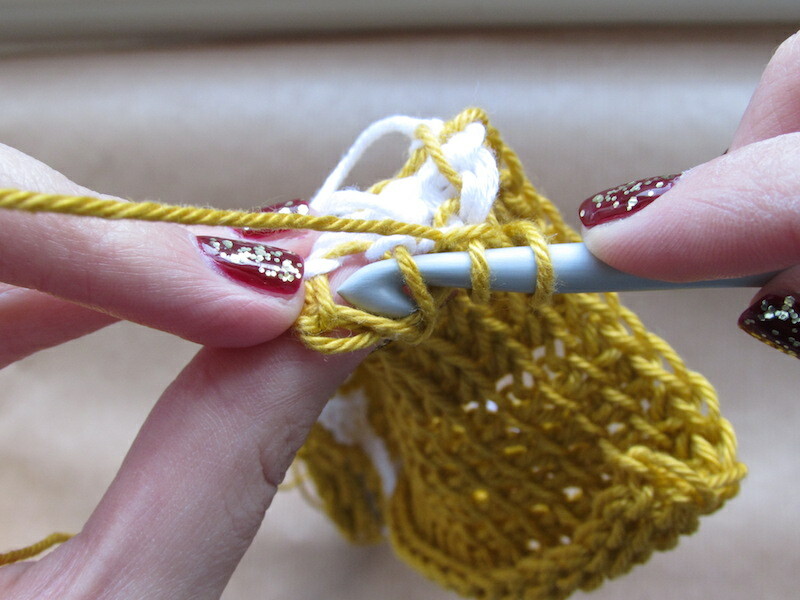 Work the return pass normally, work as many rows as you need to get comfortable with the stitch. And that is it people! 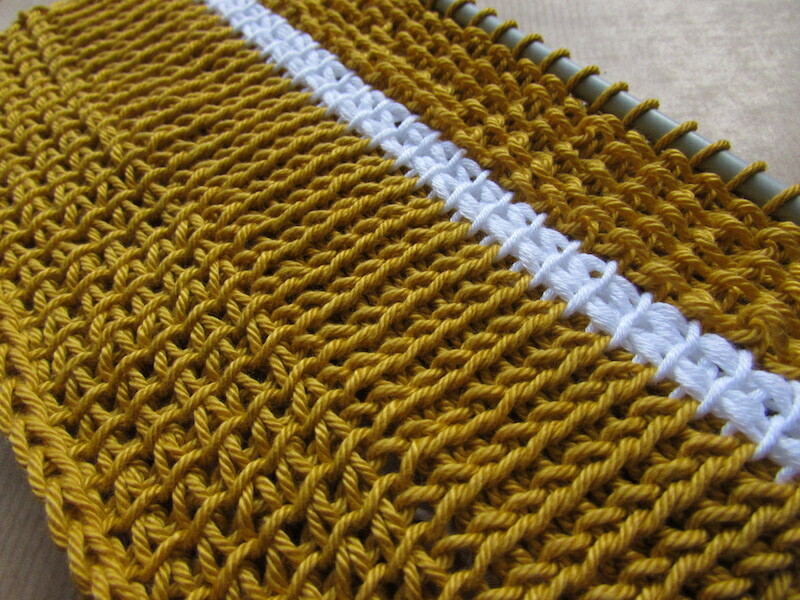 Easy and nice stitch, I will post the tutorial for that cowl soon now that you know how to work it. 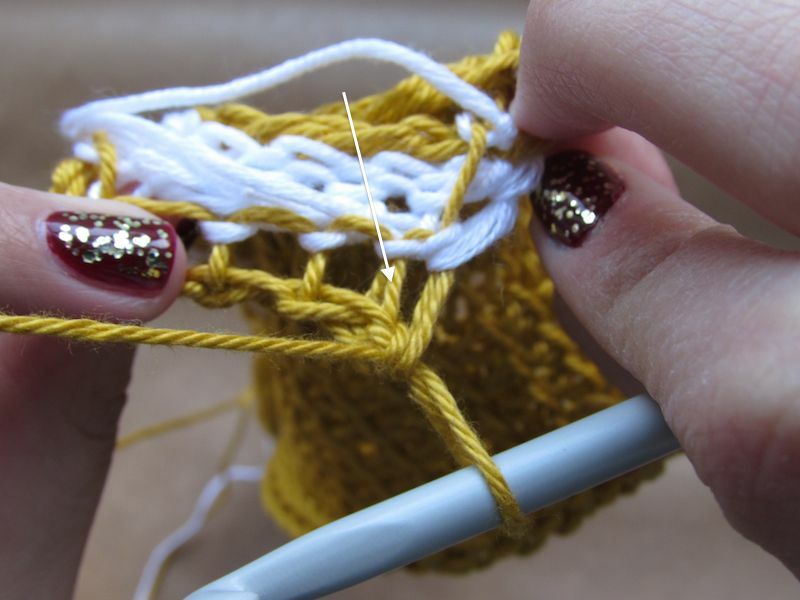 Our sample is getting bigger, I think I have three more stitches to show you and then we will have learned more than enough to work any tunisian pattern you want to try or even create your own. Return Pass: Yarn over pull through one loop on hook, yarn over and pull through two loops on hook until you have one loop left on hook. 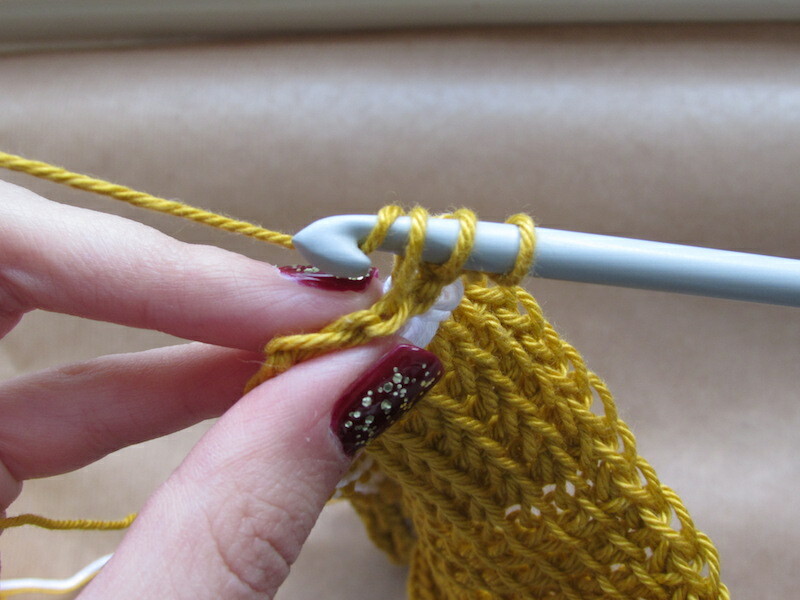 Last stitch of any forward pass: Insert hook under last vertical bar and strand behind it, yarn over and pull up a loop. Tunisian Simple Stitch: Skip first st, insert hook from right to left under next front vertical bar, yarn over and pull up a loop. Continue this way until last stitch, work last stitch normally. Work return pass normally. 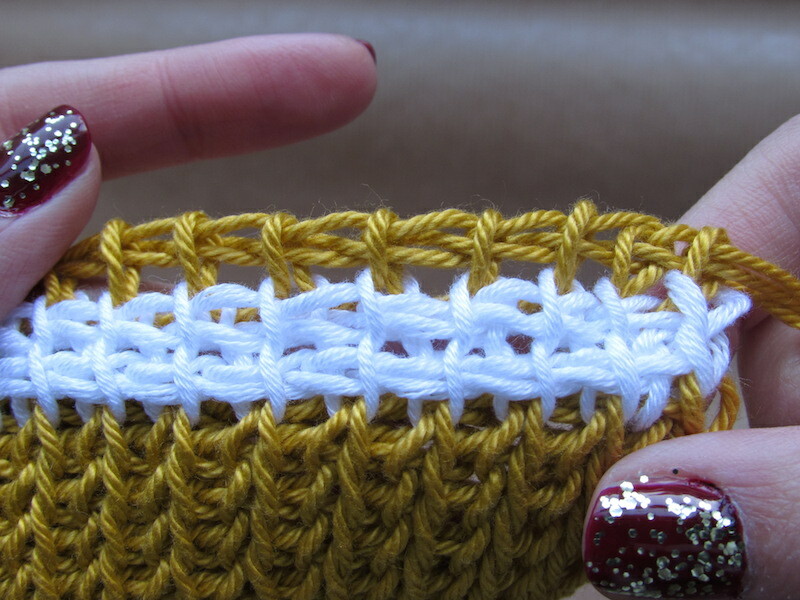 Tunisian Knit Stitch: Skip first st, insert hook between front and back vertical bars, yarn over and pull up a loop. Continue this way until last stitch, work last stitch normally. Work return pass normally. Tunisian Reverse Simple Stitch: Skip first st, insert hook from right to left under back vertical bar, yarn over and pull up a loop. Work last stitch normally. Work return pass normally. I just need to go and buy myself a bigger hook and I will get started. Thank you for the tutorials. It goes a long way in teaching me a new skill. Tunisian is my favourite form of crochet . Your tutorials here are very clear and easy to understand. Thanks! You are very welcome! Thank you for your comment, a few tunisian patterns coming up so stay tuned! thank you for sharing – i can’t upload my beginner project for you to see. i look forward to more tunisian crochet instructions/patterns. Very nice and clear tutorial. The only thing that bathers me is that for some reason when I read it screen jumps to video advertisement that you have below your tutorial. Had to return back to reading every 2 to 5 minutes. Can you do something about it?